In the above scheme, all concerns are separated into individual components, each component serves a specialized purpose. However, still the connection pool uses a single dedicated database user as in the previous simpler setup we saw above. We can always implement all three with more application code or more layers in the application, but this is just cumbersome and hard to maintain. 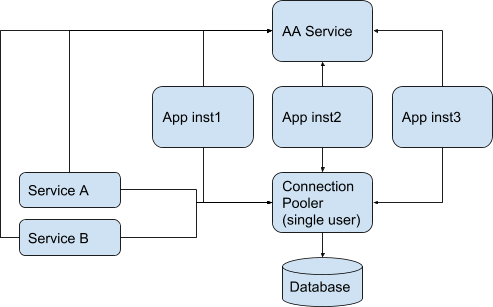 In addition, PostgreSQL offers such a rich set of solutions on the aforementioned areas (security, Row Level Security, auditing, etc) that it makes perfect sense to move all those services to the database layer. In order to take those services directly from the database, we must forget about single user in the database and use real individual users instead. 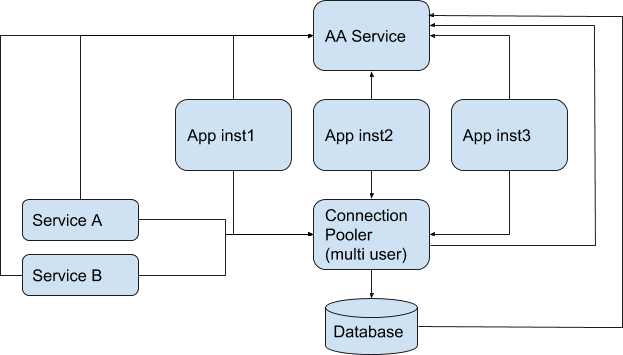 It seems like a typical setup, since jboss/wildfly has been supporting LDAP authentication and authorization for many years, PostgreSQL has been supporting LDAP for many years. However pgbouncer only started support for LDAP (and this via PAM) since version 1.8 in late 2017, which means that someone till then could not use the hottest PostgreSQL connection pooler in such an enterprise setup (which did not sound promising by any angle we choose to look at it)! In this blog, we will describe the setup needed in each layer. I have put in bold the important parameters and values. Remember to define the IP address (or hostname), the database name and the port according to your pgbouncer server’s setup. This way wildfly will delegate the security context to pgbouncer. NOTE: in this blog we cover the basics, i.e. we make no use or mention of TLS, however you are strongly encouraged to use it in your installation. The above configuration files apply to wildfly 10.0, you are advised in any case to consult the official documentation for your environment. host    all         all         ip.ofYourPgbouncer.server/32 ldap ldapserver=your.ldap.server ldapprefix="uid=" ldapsuffix=",cn=users,cn=accounts,dc=yourorgname,dc=com"
This has to do with authentication only (checking passwords). Roles membership is still done in PostgreSQL, as usual. The users must be created in PostgreSQL (via CREATE user/role) as usual. There are some solutions to help with synchronization between LDAP and PostgreSQL users (e.g. ldap2pg) or you can simply write your own wrapper that will handle both LDAP and PostgreSQL for adding or deleting users. This is the hardest part of our setup, due to the fact that native LDAP support is still missing from pgbouncer, and the only option is to authenticate via PAM, which means that this depends on the correct local UNIX/Linux PAM setup for LDAP. So the procedure is broken into two steps. The first step is to configure and test that pgbouncer works with PAM, and the second step is to configure PAM to work with LDAP. Note: The necessity for root ownership and setuid (which is true for every debian/ubuntu system I have tested) is nowhere documented, neither on the official pgbouncer docs nor anywhere on the net. You should be able to get a prompt and see the tables as if you were connected directly to your database server. Remember to delete this user from the system and also drop from the database when you are finished with all your tests. Unix passwd will be checked first, and if this fails then LDAP will be checked, so bear in mind that you will have to erase any local passwords for those users who are defined both to the local linux/unix /etc/passwd and in LDAP. Now it is time to do the final test. Choose a user who is defined in your LDAP server and also created in PostgreSQL, and try to authenticate from the DB (via pgsql -h your.pgsql.server ), then from pgbouncer (also via psql -h your.pgbouncer.server), and finally via your app. You just made having one single security system for app, connection pooler and PostgreSQL a reality!